Have you ever dreamed of fishing all day in world-class Alaskan waters? This is the best Alaskan fishing charter in Ketchikan, Alaska. 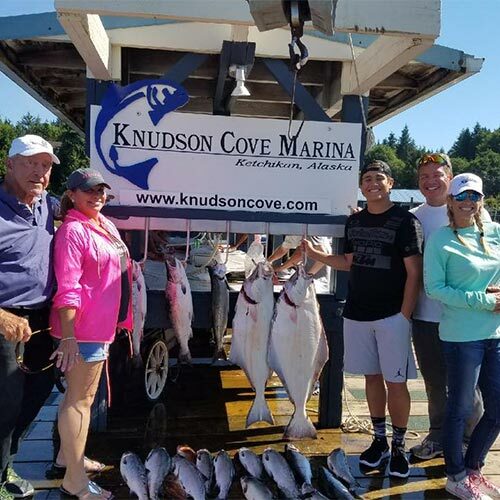 Spend eight to ten hours fishing for salmon and halibut aboard one of our 28-foot fishing boats. Our vessels are designed for the serious fisherman with a large comfortable fishing platform, a roomy cabin and a private enclosed marine toilet. Salmon: King Salmon (Chinook), Coho Salmon (Silver), Chum Salmon (Dog), Pink Salmon (Humpy) and occasionally we find a few Sockeye Salmon (Reds). And bottom dwellers: Alaskan Halibut and several species of Rockfish including Lingcod and my favorite eating fish the Yelloweye Rockfish.